We offer proffesional chimney cleaning services. Book online today! Have your single story chimney swept in Gauteng today for only R800 or R1100 for a double story. We offer great service and get the job done right, first time. We have over 10 years’ experience in sweeping chimneys. Get in touch on 067 103 0999 or send us an email at sales@chimney-sweep.co.za. We remove any foreing materials from the flue inlcuding debries and birds nests, we can also bird proof the chimney flue during the chimney sweep to make certain that no birds make a home in your chimney flue. With us your annual chimney sweep will be the minutest of your worries, we do a brisk and thorough chimney cleaning at an economical price. We use an leading edge chimney sweeping system imported transoceanically. Antique systems such as the wire brushes are less effective with todays contemporary fireplaces and flues. They generally take twice as lengthy and are more costly of the amount of time they take to complete and the labour included when attempting to push those huge brushes around 90 degree bends in many of todays chimney flues. They are plainly incapable of doing full chimney sweep because of the curvitures of these modern flues. We clean around every nook and cranny with our system and making absolutely sure that your chimney is devoid from all bit and fragments of soot. We offer a fixed price for a chimney cleaning, all inclusive of materials, tools and labour used during process, no matter the length of time the chimney cleaning would take to complete. Carpeting is still a big trend in South Africa for the living and lounging rooms. 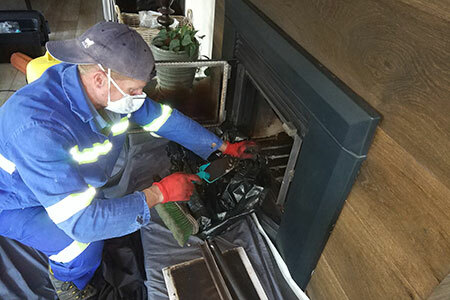 One of homeowners biggest worries is that during a chimney sweep their carpets and rugs will be ruined during the chimney cleaning process as a result of soot exiting from the fireplace below. With us, this need not be a concern. We cover the fireplace opening completely and layer sheeting beneath and work very carefully to make sure that no soot leaves the fireplace. Carpets and rugs not an issue with us. We offer chimney sweeps for homes and offer discounts on multiple townhouses. Call us today to book a chimney sweep in Gauteng for expert service. Get in touch on 067 103 0999 or send us an email at sales@chimney-sweep.co.za.